Mountain Spaces is a small independent, family business owned by Chris and Kate Lawler located in the stunning town of Morzine, part of the Portes du Soleil ski area in the Northern French Alps. They specialise in luxury catered and self-catered accommodation, creating personalised holiday packages for their guests. Chris and Kate have boundless enthusiasm and knowledge for their beautiful corner of the world, which they aim to share and provide their customers the best possible holiday experience. Creating bespoke holidays for large parties of guests generates lots of information, which was becoming difficult to manage and maintain. They were already familiar with FileMaker after creating and using their own homebrew database design, which in combination with various spreadsheets and other systems was being shared across a handful of Macs in their office. As the company is growing it very quickly becoming apparent that these systems were no longer capable of managing the company. 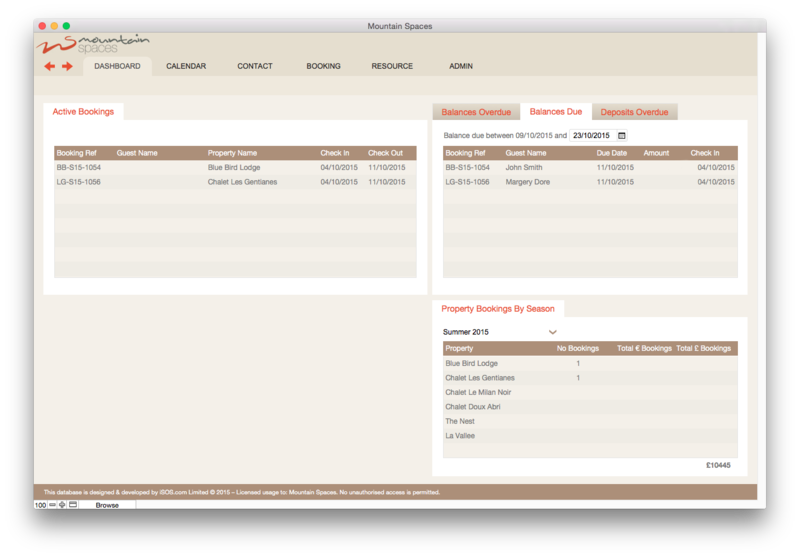 A new FileMaker database solution was specified and created to manage the very specific business processes required by Mountain Spaces. 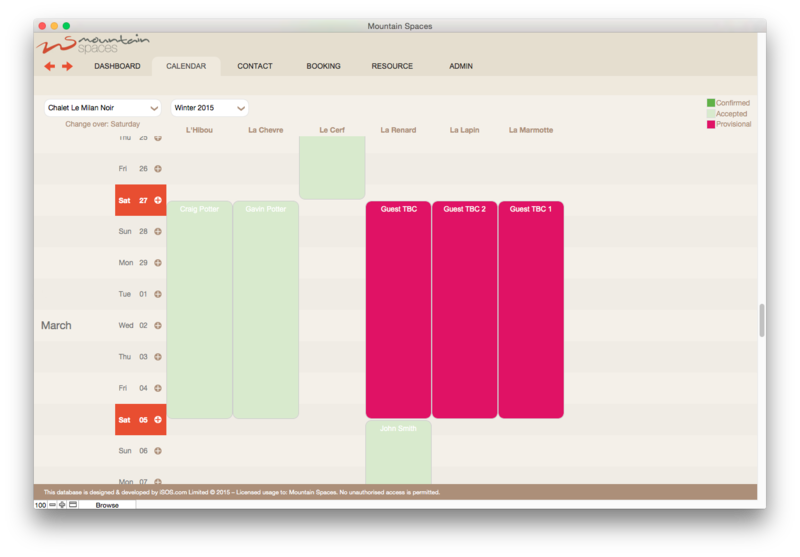 The database includes CRM functions, dashboard and a bespoke room availability calendar along with a full booking management system. The solution allows them to manage everything an individual guest may require on a Mountain Spaces holiday, whilst keeping track of key financial information and automating the management of personalised booking documents. Careful attention was taken to ensure the database was in keeping with existing digital branding, enhancing the user experience design and bespoke nature of the company. Through centralising the data within FileMaker, it has freed up time for the staff, allowing them to focus on customer service and not having to worry about where to find booking information. Streamlining the office workflow into a series of business processes managed by the database has meant that all members of staff are able to handle customer bookings and requests, while the use of their bespoke availability calendar means that new booking requests can be handled quickly. 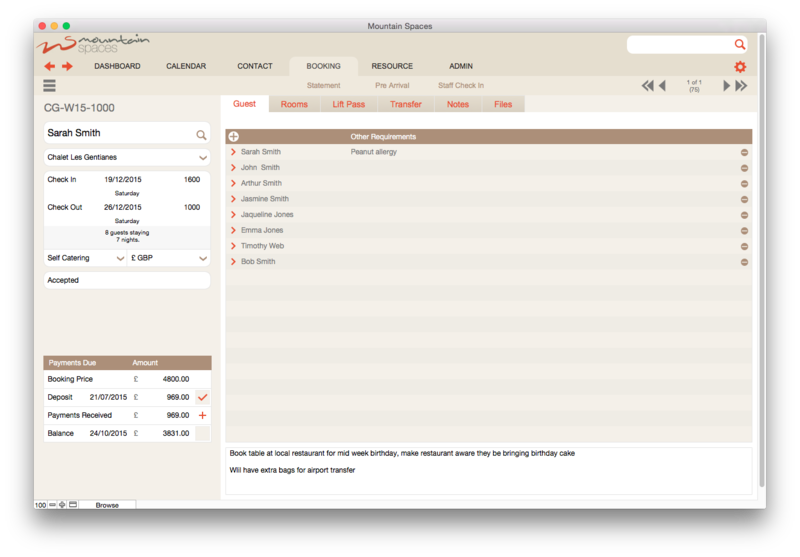 Our FileMaker developers also included dashboarding important data which has meant that details of current and upcoming bookings is available instantly. We approached iSOS to develop a scalable booking system for multiple properties with a range of room layout options solution for use by two or more users. The brief was to provide a booking system that could fit into our current work flow reducing unnecessary admin and the possibility of human error by automating some admin tasks. The system needed to be accessed by at least two people at the same time and needed to be robust and fully supported. We also wanted a solution that was built to allow the addition of additional features at a future date. We had used free or open source solutions previously but had decided to choose iSOS to develop a solution that was an investment for us in our business and delivered everything that we wanted rather than using a free but compromised solution. iSOS listened to our brief and our needs and were able to provide us with advice, suggestions as to how to structure the solution and eventually an accurate, detailed quote that didn’t change during the entire process. The solution was delivered on time and on budget. We’ve been using the iSOS solution for a couple of months with multiple users, requests for minor changes have been met quickly and efficiently and we feel much happier knowing our data and database has been built to Filemaker best practices and is fully supported.